We have some hot, steamy, zombie on zombie action straight from the E3 2009 show floor - courtesy of Scott Benton from Colony of Gamers. 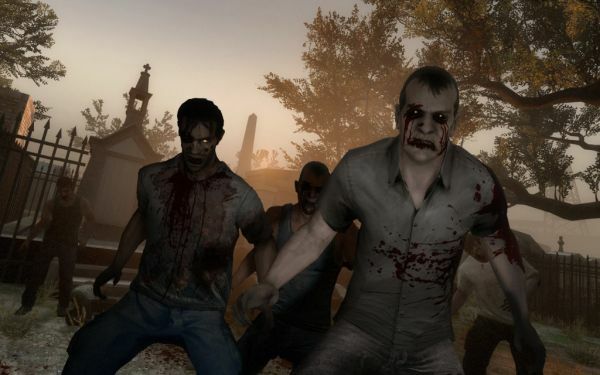 The Left 4 Dead 2 footage shows one of the new campaign maps, one that's open in broad day light. Things look a bit more brutal this time around, and we even get to see one of the new special infected, The Charger. Joystiq and Kotaku both got some quality hands on time with the title. There's a few new additions that haven't been mentioned yet. The first being incendiary ammo for your guns, allowing players to take explosive shots on the soft zombie flesh. We also know there will be five campaigns and four gameplay modes; campaign, versus, survival and a secret mode which has yet to be unveiled. Melee weapons are a big addition, and will take the place of your gun, so there's no dual wielding an Axe and a Shotgun. While there's still only molotovs and pipe bombs, it's been hinted at that we'll see more grenade types as well. Another big change is the ending of levels, or the crescendo moments. No longer will survivors merely have to stay in one place to survive, instead there may be something slightly different. Enter the first crescendo moment of "The Parish" in Left 4 Dead 2. The Survivors enter a courtyard of twisting alleyways of chain-link fence, with a tower in the center. An alarm sounds as the Survivors enter the courtyard, bringing the horde with it. The only problem (um, besides armageddon)? The switch to shut off the alarm is on top of a tower in the center of the courtyard. Thus, instead of defending a static location until rescue arrives, the Survivors have to battle through a gauntlet of Infected and make their way to the tower where they can shut off the alarm and stem the tide of living dead. That sounds pretty interesting. For now check the video of the game in action. It makes me feel like firing up original Left 4 Dead again. Page created in 0.2504 seconds.